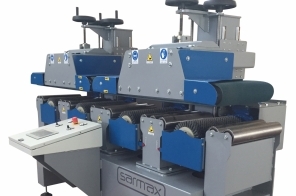 The single or multi sides sanding machines by brushes model DAKOTA for solid wood or MDF elements offers a broad range of uses, from window and door components to carpentry pieces such as dovetailed wall cover, floor planks and furniture elements with maximum working capacity of 30 x 30 cm. Available in different models to work from 1 to 4 sides simultaneously, the Dakota target is the one to get rough surfaces into ready surfaces (poro opening) for a further coating or impregnating process thanks to the brush abrasive paper leaves. After the first layer of base coating, a second step of sanding can be performed to obtain obtaining a perfect and smooth surface ready for the finishing hand.